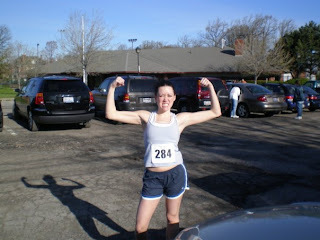 6 years ago this past weekend, I ran my first 5k - The Ambulance Chase in Lakewood. I think I've mentioned that I may have been THE most un-athletic person ever growing up, and if we could go in a time machine and tell 15 year old Roxanne that she'd be running someday, she would laugh at you. Heck, if we went back 7 years, I never would have imagined that I'd start running. But...life is crazy like that. 6 1/2 years ago I was in a rotational program at work that put me in a department with young, athletic, new college grads from outside of Cleveland. My actual job wasn't so great (I didn't enjoy it - that's what's great about rotational programs - there's always an end in sight) but the people I worked with were incredible. At 25, I felt like an old lady in the group because I owned a house, had finished grad school, and didn't go out every night of the week, but my new coworker friends accepted me just the same. And they even rubbed off on me. They were really eager to explore Cleveland, and hanging out with them allowed me to see more of the city in one year than I'd seen living here for 25 years. (and I've kept that trend going - I go exploring in the CLE all the time) They were also into running. (and facebook - I would not have joined facebook without them) In January of that year, someone in the group suggested that we all run a 5k in Lakewood in May. I'm not sure I'd ever heard of a 5k then, let alone considered running in one. But I was up for the challenge and wanted to participate in this neat sounding event with my friends. Besides being nonathletic, I knew nothing about running. I didn't know what to eat, wear, or how to train. (I used to run in tanks tops from NY & Co.) But my man Hal Higdon has a training plan for everything, and I was able to follow his plan and finish a 5k without dying. (after overcoming my fear of treadmills - I could write a whole post on that) It was an incredible feeling. I got the running bug and have since run more 5ks than I can remember, a bunch of half marathons, 2 full marathons, and this weekend, I'm attempting a 50k. But for as happy as I am to have discovered running, I am even happier to say that I ran in this past weekend's Ambulance Chase with my mother. Why is that a big deal? Because she just started running herself. She'd mentioned wanting to get into better shape and since I love running so much, I encouraged her to start the couch to 5k training program, which literally takes you from zero running to running a 5k in a matter of months. Hearing her talk about her training made me realize where I get my determination from. My mom is one tough lady and didn't quit. She spent tireless hours on the treadmill and in her neighborhood, religiously following that plan. Not an easy feat for anyone, but my mom is twice my age. How many 60 year olds do you know who wake up and decide to go running? Race day was gorgeous. Probably the nicest weather I've seen for the Ambulance Chase. (I try to run it every year since that's where my running obsession got started) My mom thought she'd be cold, though, and was wearing long underwear under her jogging suit. (yes, jogging suit and long underwear - apparently not knowing about appropriate running attire is genetic) Before the race, my mom told me that she'd never run more than 2 miles, so I was a little nervous for her. I planned on sticking with her no matter what, though. She hoped to finish in 45 minutes, and tried to talk me out of staying with her, but I was determined to cross that finish line together. Even if that meant we walked half way. We positioned ourselves near the back of the pack, and when the bell started ringing to announce the start of the race, we shuffled our way to the starting line. But then something cool happened. We started passing people. My mom was cruising along like this was the easiest thing she'd ever done. To keep her distracted, I was chattering away, but reminded her to not talk and save her energy. Before we knew it we were at one mile. There was a water stop and I asked her if she needed anything. Nope. Completely fine. We kept running. 2 miles. 2 easy miles. I thought that my mom might have some difficulty at this point, but she actually picked up her pace. In my head, I thought, "holy cow! she's got this!" We kept chugging along until we crossed the finish line at 35:27 - nearly 10 minutes faster than my mom had predicted. (and as we later found out, she was 4th in her age group) I honestly don't think I've been happier about finishing a race. I was so incredibly proud of my mom. Running this 5k with her meant more to me than any race I'd ever run, at any distance. Sharing that experience with her is something I'm never going to forget.